Our latest Colombia luxury hotel review is a boutique property we’ve been meaning to get to for a while: Hacienda Bambusa outside of the city of Armenia. We have fond memories of the Coffee Triangle of Colombia after visiting the area twice, once on its own and once in conjunction with a visit to Cartagena as well. It’s kind of a pilgrimage area if you’re a serious coffee lover and the countryside is gorgeous. 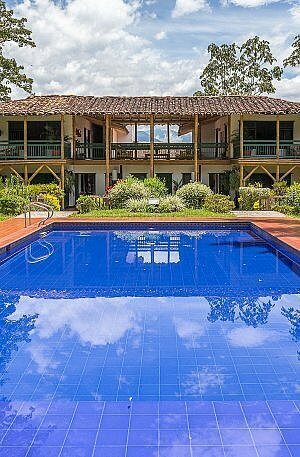 Hacienda Bambusa Hotel is seriously in the countryside, to the point where there’s no official address to the place. The delivery people just know where to go. If you’re coming to visit as a guest and don’t have a driver who knows where he’s going, you’d better call ahead for directions. Once you get there though, you’ll be rewarded. There are a lot of routine hotels in this area meant for tour groups and domestic travelers and it’s been difficult for us to find a few standouts worth featuring. We’ve had Bambusa on our radar for a while though and finally got one of our contributors in there to get a first-hand look. There are just nine rooms at this intimate boutique hotel, but they’re well-equipped with high-end amenities and two meals are included in the rates. Weather permitting, meals are usually served outside with a view. You’ll probably spend a lot of time outdoors since this whole area is a kind of nature reserve. 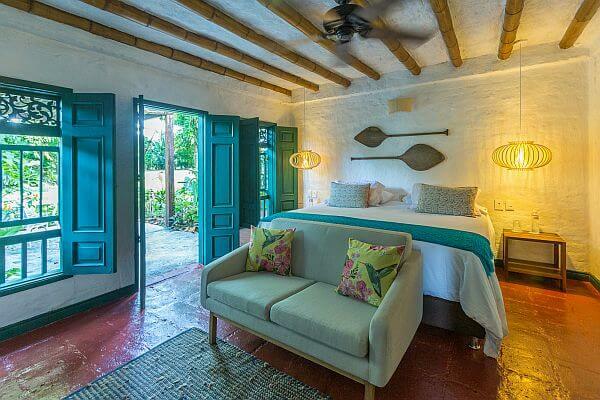 All of the rooms at Hacienda Bambusa are named after a type of bird as a nod to the 127 species of birds found in the area. Hummingbirds make up a large portion of those species and the hummingbird feeders all around the property are never left empty. Sloths, red howler monkeys, and night monkeys are also sometimes spotted. Your best chance of seeing all that wildlife is during the 1.5-hour guided Cacao Waking Tour (included in rates) which is an easy stroll through part of the huge farm. It’s clear that the family owners have the resources to properly maintain this hotel also: the owners are the family of Colombian race car driver Juan Pablo Montoya. There’s no place to vroom vroom around here through. Just settle in and enjoy a nice cup of coffee with a view and relax in the swimming pool between excursions. Naturally the staff can set up other activities in the region and make sure special requests are taken care of. 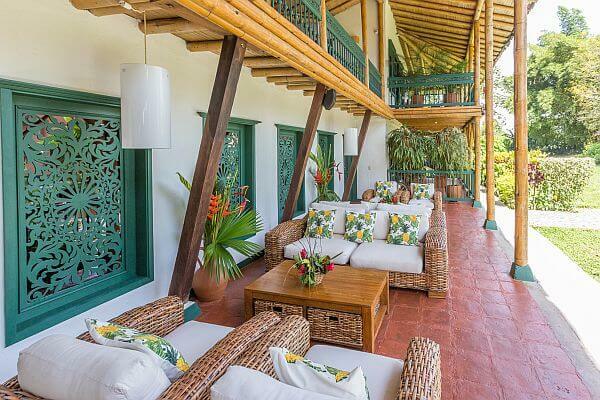 We’re happy to be adding this property to our curated list of the best hotels in Colombia. See more photos and our full review of Hacienda Bambusa Hotel in the coffee region, near Armenia.